First off, we ought to really assess how rare a phenomenon firing is after an 0-7 start in the NHL. And it’s not just rare, it’s virtually unprecedented. 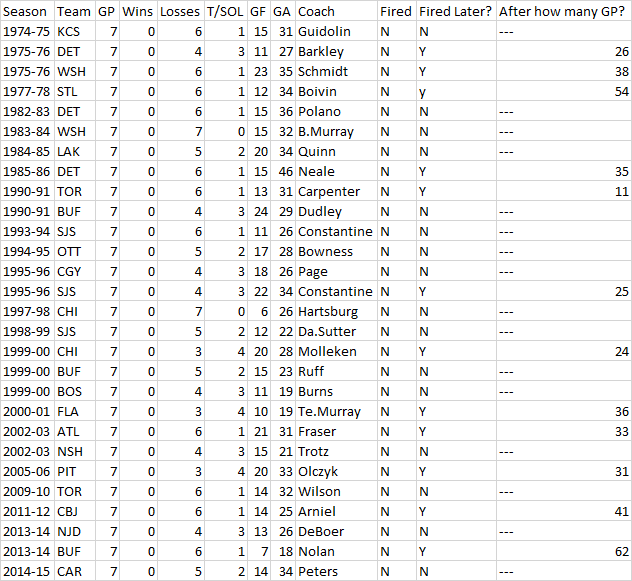 Since 1974-75 (when NHL seasons expanded to 80 games), only two teams have started their season 0-7…and neither fired their coach, not then, nor later the same season. In 1983-84, the Washington Capitals chose to stick by Bryan Murray after 7 straight losses, and they went 48-20-5 the remainder of the season – to that point, their best finish in franchise history. The 1997-98 Chicago Blackhawks began the season 0-7 under Craig Hartsburg, then played average hockey the remainder of the year at a 30-32-13 clip. Hartsburg was canned after the season, only to subject Hawks fans to a motley carousel of coaches the following four seasons. Only 12 of 28 coaches were fired within the same season, and virtually none were granted fewer than 20 games to prove their mettle. The only exception was Toronto Maple Leafs’ head coach Doug Carpenter, who was fired after stumbling to a 1-9-1 start in 1990-91. The Leafs’ players were quick to defend Carpenter, including future bad coach Ed Olczyk, but if his Wiki is any indicator there isn’t a lot of love lost for the guy. Whatever the case, historically there just isn’t much precedent, and for good reason. Teams have always known to not overreact so early in the season…there is no other reason why it took teams so long after those first seven games to fire their coaches, even in the worst cases. The teams above averaged a 51% points percentage the remainder of their games, sufficient most years to keep a team competitive in the standings. In other words, a winless 7-game start is anything but a death sentence, and the NHL has known this for a long time. It makes it all the more amusing that Harrington should be the one that jumps into the fray. Look at the list again. On three separate occasions, it was Harrington’s own Buffalo Sabres going winless in seven, and in only one of those cases – Ted Nolan – was the coach eventually fired…after 55 more games. In fact, Harrington’s itchy trigger finger would’ve ended celebrated Sabres coach Lindy Ruff’s reign in his third season. The fact of the matter is that, barring some undisclosed actions by Todd Richards, this seems to be an unnecessary knee-jerk move against a guy who has brought a lot of success to the Blue Jackets’ organization. He deserved a chance to shake out the cobwebs, in the same way Ruff had, oh, I don’t know, three or four chances in Buffalo? Whatever the case, this a whole lot of overreaction, and Harrington of all people should know better. He’s a Buffalo Hall of Famer, for Chrissake. Whether you’re basing your assessment of the Richards’ firing on NHL tradition, wins and losses, or fancy stats…or unwittingly none of those…the grounds for justification are pretty scarce in this case.